Welcome to all of you that are finding this post on Pinterest or Facebook. I am so glad you found me. I blog about all kinds of frugal home and DIY projects, yard sale and thrift store finds, crafts, and the occasional recipe. If you enjoyed this post, make sure to follow my blog by subscribing by email, or following me on facebook, twitter, or Pinterest so you can see future projects. I have some Frugal Finds that I can’t wait to share with you, but I didn’t want today (Good Friday) to pass by without me sharing an Easter themed fun project I did with my nieces a week or so ago. My friend Christa wrote a great post on the significance of Good Friday in our lives. I love how she says, “This weekend defines the existence of my entire life.” And she is so right. Because on Good Friday, my Lord was crucified on a tree for ME… to take my place…to give to me eternal life. BUT unlike any other god, HE didn’t stay dead but arose from the grave three days later which is why we celebrate EASTER. Without this weekend, I would have no hope, no joy, no peace of having my sins forgiven and an eternal home in heaven. So this weekend is very important to me and I hope to you too. Last weekend, my 2 little nieces spent the weekend with me. We had two “night-night parties” as they call them, and we had a blast! We painted nails and toe nails, ate ice cream, grilled hotdogs, made nachos for dinner, went shopping at yard sales, and did lots of playing outside. 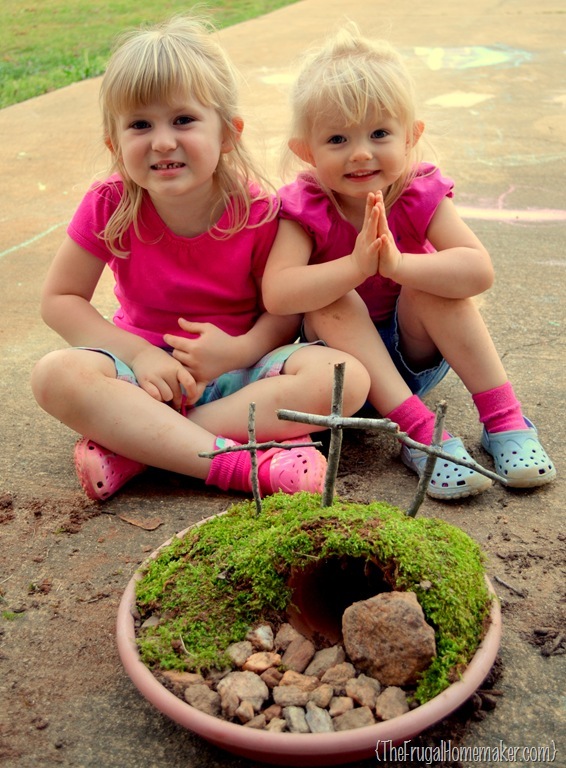 And we did this Easter Garden project that I had found floating around Pinterest. 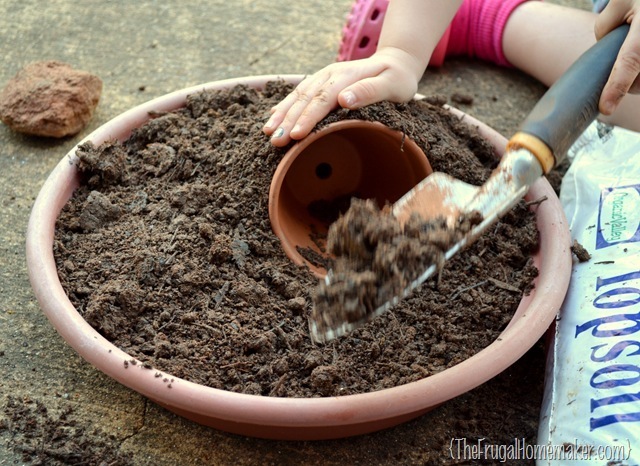 Fill your basin with soil. 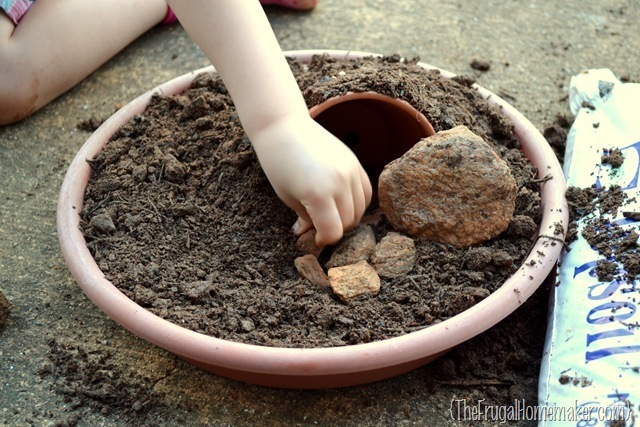 Once you have a thin layer of soil in the bottom, place your small planter inside and fill in around it. Here you can see we filled up the whole basin and all around/over the small planter (you want it to look like a cave.) We wet the soil a little to help pack it all around the small planter. Now at this point you can plant grass seeds all over the hill and down the sides. Wheat grass seeds are the best as they germinate and sprout in days (I think about 10 days). But I couldn’t find any wheat grass seeds in any local stores. You can order them very cheap online – like these from Amazon. BUT I spotted a hill of moss on the side of our house so we just carefully skimmed some of that off the ground and laid it on top of our hill. Using little pieces here and there and filling in all the spots. Then we found some sticks and broke them to the right size and glued them together to form 3 crosses. And our garden was done! My nieces are ages 2 and 4 and go to Sunday School with us each week. As we were doing this project, we were talking all about the Easter story. About how Christ was beaten and how He died on the cross for our sins. But they made sure to say “But he’s not dead anymore! He got alive again on Easter.” Even at their age they know sin is the bad things that they do. And the oldest one was fascinated with a story their babysitter had been telling them about the other two men that hung on the crosses next to Jesus – how one went to heaven with Jesus when he died (because he accepted Christ’s gift of salvation) and how the other one didn’t. My nieces are a little young and they don’t completely understand all about salvation yet, but I am thankful that they are beginning to grasp bits and pieces and understand more and more. Looking forward to Easter Sunday and celebrating with them the resurrection of Christ! I will be back next Friday with lots of frugal finds to share with you! And don’t forget the 2nd post in our “How to shop yard sales” series will be on Monday and the 2nd post in our “Sprucing up the outdoors for spring” series will be on Wednesday, plus I few other things to share too. praise God we serve a RISEN Savior! How cool! Great idea to use the moss too! I’m sure they loved making this! they did! it was a fun, easy project and a really good visual. Love this! I believe Harrison will live it! I know your nieces had fun with it too! Thanks for sharing! Cute idea!!! That is awesome! And your girls are so cute! This is just so sweet Christina – I love it! I love the moss! It’s such a natural idea, as are the twig crosses (instead of craft sticks). Just beautiful! Jen @ http://enterundermyroof.blogspot.com recently posted..Easter Symbols – and where the egg came from! thanks so much, Jen! It really is a pretty “craft” to reflect on God’s gift to us. I plan to do this with my granddaughters age 5 and 3. The 5 year old told me last Christmas 2012 that my manger didn’t have the star on top so we made a star of cardboard covered with foil then had to add gold ribbon since the star needed to be ‘yellow’. I think yours came out just as nice. It’s a bit more authentic looking. I agree. The moss and the broken twigs just make the whole thing, as far as I am concerned. 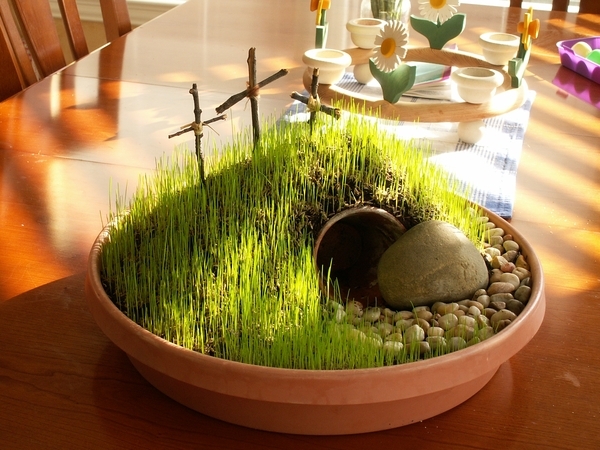 I want to make one and take it to the Children’s Church class for Easter. Thank you for sharing. Many health food stores sell bulk wheat or grains for sprouting that would work or you could also try using a cat grass mixture-that will sprout and grow quickly. OMGosh, your kids have the SWEETEST little faces!!!! Thanks for the AWESOME idea!!! I love that you can teach the meaning of Easter, AND have the little ones involved! Oh, and it looks AMAZING too. Thanks for sharing! Christina, so glad my cousin posted the Easter Garden Tutorial on my FB page. 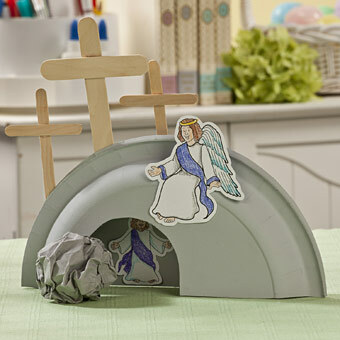 What a sweet & easy Easter project for the children. 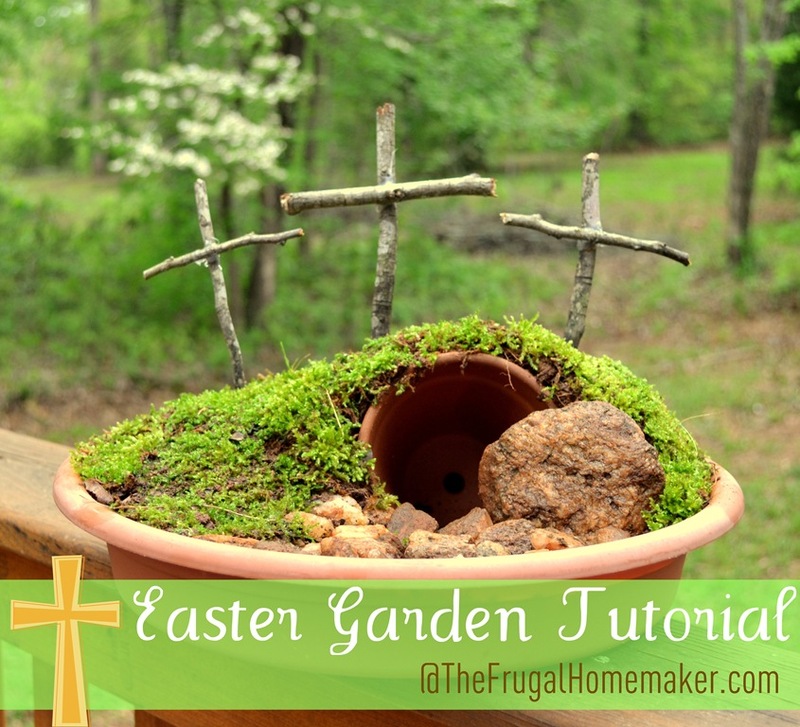 Printed out the tutorial & plan on taking it by church so perhaps the kids can start making their own Easter Garden. Also shared w/my FB friends so I’m sure our church family will get a copy as well. At least that’s my hope. Thanks, again. I love that you tell the Easter story when you were making the Tomb of Christ. 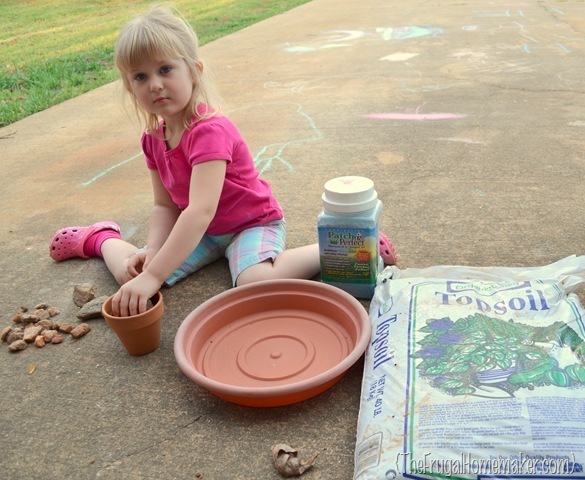 I am glad you shared with us how to make this and it will be cheap and fun. Im going to do this with my 2 year old granddaughters. This garden tomb is awesome. Thanks for sharing how to make it step by step. I loved seeing your little nieces hands patting down the soil making the tomb. I loved how you shared the Easter story and your experience with them too. I can’t wait to do this with my great niece and nephew this year, my niece and I will have so much fun with them doing this. Thank you for sharing. Where did your friend find the Jesus pic in her craft? I clicked the link and it says she is no longer there. Would love more of these types of crafts for sunday school and bible school. can you help? 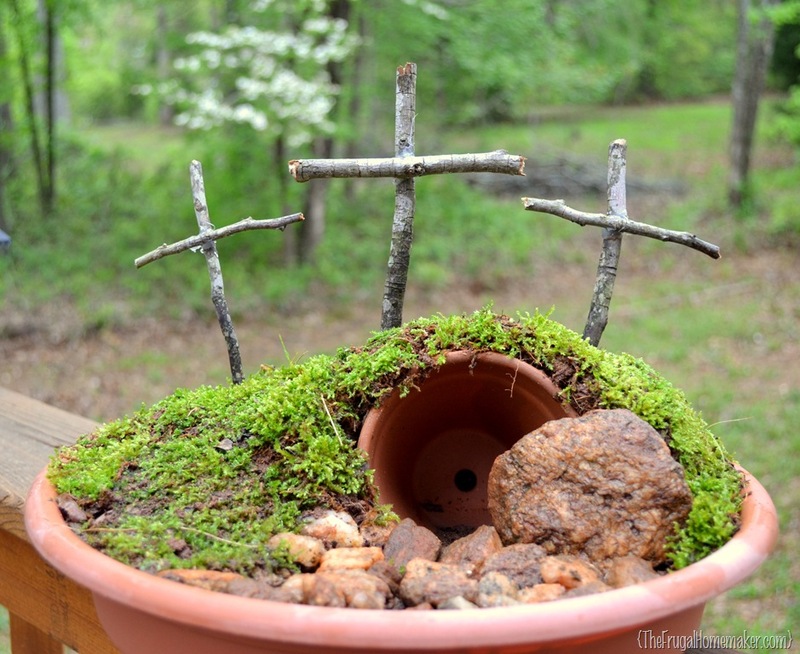 The tutorial on how to make Jesus’ empty tomb with a clay drip pan and pot ,dirt,rocks and moss is great but what could those of us do who are under 5 feet of snow do to replicate it since we can’t do this at this time of year? I think you would just have to have all the materials purchased because I know what you mean that sometimes Easter can be snow covered! Even though outside looks chilly I am sure your stores have their spring merchandise out so you would have to actually plant seed and finding the twigs might be difficult but you might just have to go with craft sticks. I know your reply was so long ago but I am thinking of doing this for Christmas even if I can find the supplies and it should be small enough that you could grow a little something inside. (And maybe now if you read this it will just remind you and you can get some twigs picked up this fall to put aside for this and other crafts in March!) Blessings! Hi Christina, thanks so much for this post !! A friend just sent it to me…My friend & I have “Jr. Church” during the month of April and guess what we and the kids are ALL making! Easter is so much more than just candy…it’s God accepting His perfect, sinless Son’s death on that cross to take away everybody’s sins…all each one of us has to do is believe it, ask forgiveness for our sins and accept His Son, Jesus into our life. HE did ALL the work !!! Completely love this! My kids are grown but I love this as a centerpiece! Love, love, love it! I’m making it for ME! For the wheat grass part, the wheat that is sold for grinding into flour should grow. Its really the same thing! Nowadays its available in many grocery stores that sell in bulk. It would only take 1/3 cup or so to cover a big saucer. TY for the inspiration, & for the directions on how to make it. I wasn’t sure just what size pot to use…now, thanks to you, I do. 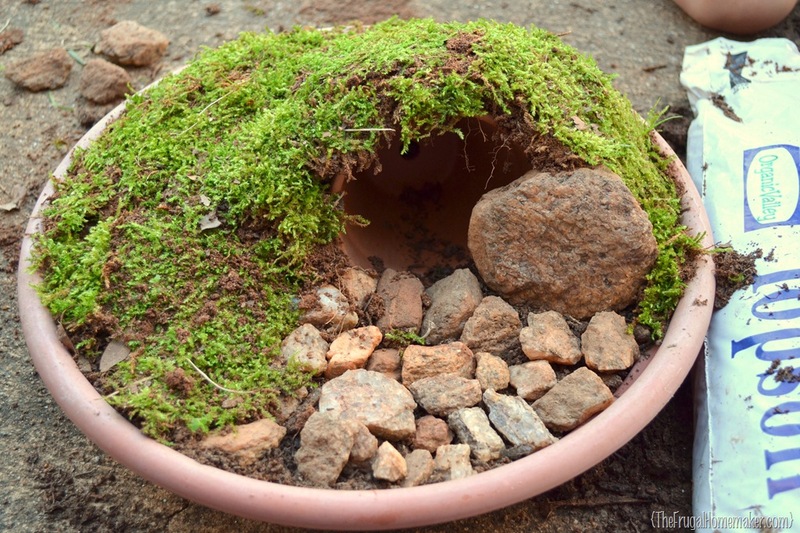 Just have to figure out where to get the moss…. with utilized tire companies. How beneficial to know tools like wrenches and ratchets. If using moss, will it take and continue to grow/stay fresh indoors or will it die and smell and therefore the garden should not be made too far in advance of Easter? Thank you for sharing. I have been wanting to make this since I first saw it last September, but do to health problems, & frequent flier miles to & from the local hospital, I have not been able to….yet. Do you by any chance know what kind of moss that was that you used for this? Or, Can you recommend a type of moss? I saw an Irish Moss last summer, but I wasn’t sure if that wound look right…. I just want this project(the one I make) to look nothing short of FABULOUS! My kids (ages 9 and 5) each made one of these garden tombs this year. They came out some cute! Awesome! I love reading this post. Thanks for sharing! Great way for even the young ones to understand what actually happen on that day, and most importantly to know that “He has Risen”. Thank you for sharing, the 2-6 year old’s in my class at church will be doing this! Wow! Great way to teach little one or new believers. I lead my ladies Bible study group. This will make a great conversation piece on my coffee table. Or possibly a craft night take home. Endless possibilities. 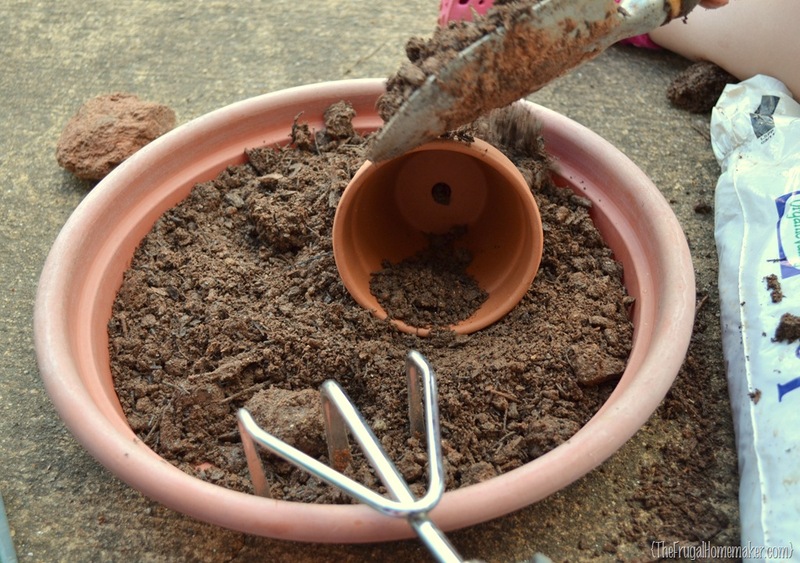 Did you seal the bottom of the clay tray? Wow, I absolutely love this idea for my family! This tutorial is really great and helpful. Thanks for sharing.